Prestigefyldt XVIII stilfuld lejlighed, fuldstændig renoveret. Helt rolig, solrige, lyse og ekstremt lysende. Soleil lejlighed (VRBO # 335283) er samme bulding, samme etage, hvis du har brug for en anden enhed. - Et separat soveværelse med en queen size seng fra den højeste kvalitet. - Helt stille med 3 dobbelt glazzed vinduer, se på gaden, og luft conditionning. - Superb badeværelse i varme, afslappende farver (sand, bambus, blank brune). - Rummeligt brusebad med håndbruser, "rain shower" brusehoved og glasdøre. - Fuldt møbleret med opvaskemaskine, vaskemaskine tørretumbler, komfurer, mikrobølgeovn, expresso maskine, brødrister, expresso, køleskab, madlavning ustensils, gryder, pander og forskellige briller. - Gratis internationale opkald, blandt USA, Canada, Australien og Europa. We enjoyed our stay very much in the Marais; it is a vibrant and interesting neighborhood. The apartment is well furnished, comfortable, quiet, and well located; close to grocery, wine stores, good neighborhood restaurants, and the Metro. We did cook a few meals during our stay, and the kitchen is well stocked with cookware and dinnerware. Pascal is a welcoming and helpful host and was available throughout our visit to answer questions. We would absolutely stay here on our next visit to Paris! 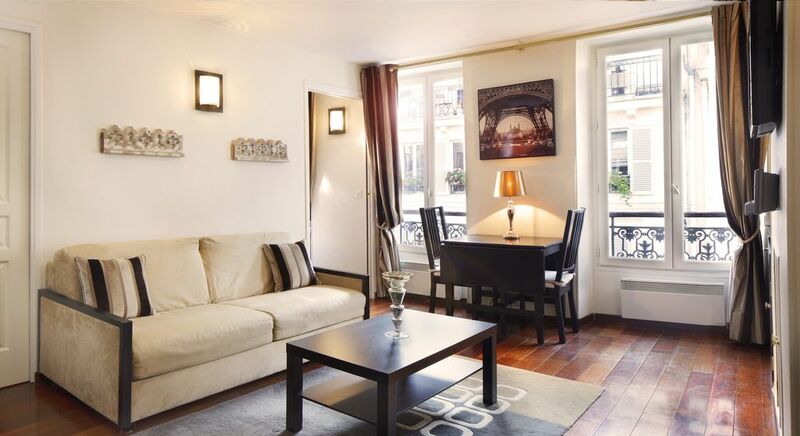 The apartment was located in Le Marais which is a very exciting neighbourhood with lots of activity both day and night. We were within walking distance of great restaurants, shopping, the Metro, as well as the key sites one would want to visit during ones stay in Paris. We stayed here for 17 days and LOVED it's charm and convenience. This property was exactly as advertised. Our host, Pascal, met us at the apartment and explained our stay in great detail. He was easy to speak with and could be contacted 24 hours. The apartment was very comfortable for two of us. There was a small kitchen area, Nespresso coffee machine, electric kettle and frother. Sink, cooktop, small fridge and microwave with plenty of dishes, flatware, pots available. Washer/dryer combo with detergent provided was a bonus for our 17 day stay. Small adequate bath with shower only. Queen bed, small closet. Cable tv with many English stations in living room. A free (to most countries) international/local phone available! Free Wi/Fi! Location for groceries/bakeries/sweets/shopping right down stairs. Lively neighborhood below. Husband used earplugs for late night revelers, early morning trash pickup. Metro 5 minutes away on busy Rue Rivoli. Pascal was helpful with suggesting activities and restaurants both personally and with a helpful compendium in the apartment. Be aware! There are 65 steps up to the apartment. NO ELEVATOR! Not for anyone in bad health. Pack light! Large luggage not easy to transport up the stairs. Host Pascal arranged for our pick up from the airport to the apartment about an hour away. Reasonable rate was worth not dealing with taxis or Metros upon arrival. The apartment surpassed our expectations. It looked exactly as pictured. The bed was comfortable, the apartment was well equipped and it was on the most charming street in all of the Marais (in my opinion). It was absolutely perfect for 2 adults as a home base while we explored the city. It was an easy walk to many locations, and the subway was 2 blocks away which we appreciated at the end of long days when our feet were tired from sightseeing. Pascal was a pleasure to work with and he made several excellent restaurant recommendations. He was happy to answer any questions and it felt like we were in the hands of a true professional. The apartment was on the 4th floor which was no problem at all for us, but just something to note if you have difficulty walking up stairs. We will definitely work with Pascal again on our next trip to Paris!